Celebrate in style with these fun and unique Cheetah themed birthday party ideas! 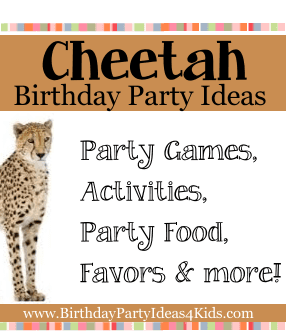 Fun party games, activities, decorations and more with a Cheetah theme! Cheetah fur is distinctive with it's light brown background and dark brown / black spots. The spots are solid unlike the Leopard's spots. See our huge list of fun birthday party games for girls. We also have party games to fit any age group. as: strawberries, marshmallows, pineapple, cookies, etc. square of printed fabric and tie the ends together. Place party favors in a safari hat and tie with a cheetah print ribbon. Cheetah print boxes or bags can be tied with a pretty ribbon to hold party favors. Buy note cards with a cheetah print on the front. Print out party information on brown or white cardstock - print out 4 to a sheet of cardstock. Cut them out and paste to the front of the cheetah cards making sure that they are an inch smaller on all four sides so that the cheetah print shows through. Buy pre-printed blank invitations with a cheetah pattern and then print the party information on the inside with your home printer. There are several ways to decorate for a little diva and make the party upscale and classy. Or use a safari theme (see our safari themed page for ideas) and include all kinds of safari animals to use as your inspiration. 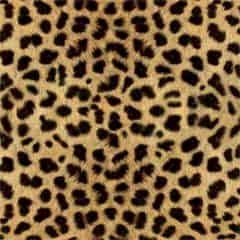 For a posh party think "luxury" and cover tables with cheetah print fabrics. Solid color party plates, cups and napkins look elegant against the cheetah pattern. Choose an accent color such as pink, aqua or turquoise and add helium balloons around the party area tied with cheetah print ribbon. Add groupings of candlesticks or a candelabra to the party tables for a special touch. Serve sparkling cider in plastic champagne glasses. from the Spa Party to give party guests a relaxing spa experience. You will find great homemade spa recipes for chocolate facials, scrubs and masks that you can make easy with things you can find at your local grocery store.